What the Marathon Means to Me. We have passed the halfway point in both miles and time. 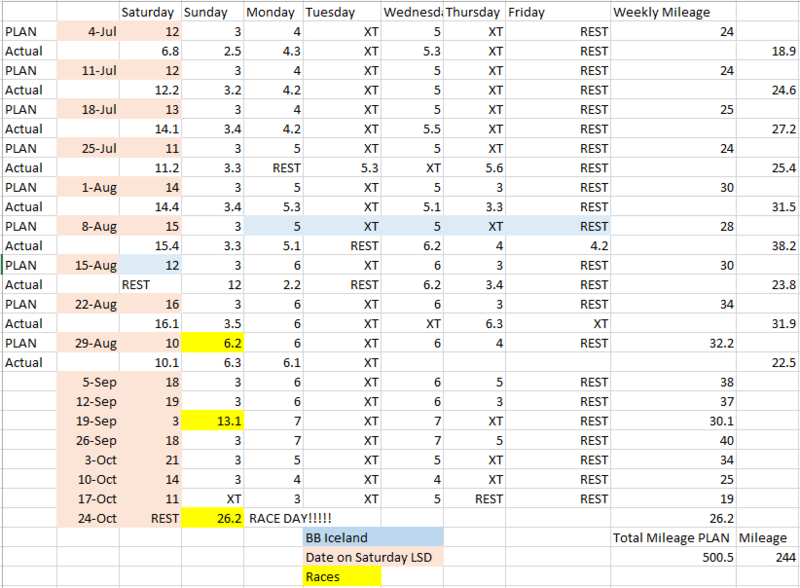 Below is my 16 week marathon training schedule I laid out. I based it reasonably closely on schedules I’d seen online, with a few of my own tweaks. Because we’re training for a finish, not a time, I didn’t feel the need to put in a lot of complicated workouts (I don’t like them, anyway) and I didn’t feel the need to put in a huge number of miles. The goal is simply to get my feet around 26.2 miles. I’d say that so far we’re succeeding. As you can see, I haven’t adhered perfectly to the schedule, but I’ve been pretty darned good. BB’s grid would look a little different, because she was in Iceland, and we haven’t always deviated from the schedule in the same way. But mostly, both of us have been very faithful to the plan. My cross training during this time has included a bunch of gym/strength/weight training, and about 200 miles on my bike. BB’s is mostly around a crossfit-type class she does, and a brutal strength/weight program she has from an app she uses. What I’ve learned so far about this is that training for a marathon, once a certain base-level of fitness has been acquired, is about mental discipline. Some days I don’t want to run. Some days I don’t want to train. I’m not exactly tired, I’m not injured. I’m just emotionally fatigued with it. And I go run. Because I have to if I want to achieve the goal I set out to. And once I’ve run, I feel better. But being disciplined requires, well, discipline. It’s less about actually doing the runs, and more about the choices I make. For example, I have a friend who’s moving to the West Coast. It’ll be a lot harder to see him soon. He asked me to hang out in New York with him for a weekend in September. I had to say no. I have to run. I don’t have the bandwidth to do all the work I need to do to achieve this and also go do that prior to the marathon. I know some people will think that’s an indefensible decision. But that’s the choice I made eight months ago when I decided to run a marathon. This marathon isn’t a fitness goal, or a running goal. It isn’t a hobby. It’s a marker of achievement for my life that I’ve elected to undertake. It’s something that I want to accomplish to represent an emergence from a life of addiction and misery. It’s an attempt to ensure a healthy life free from the devastating complications of chronic illnesses that have stricken my family. It’s an investment in my relationship and my intimacy with my partner. It’s a challenge I set for myself to signify that I am capable of high achievement. It’s something that helps me tell myself, I am a man in the world. Someone who does difficult things. Someone who works hard and makes progress. Someone who isn’t afraid to overcome pain and risk failure to succeed. This is my goal. This is my pain. This is my life. Here I am. Take another step. Don’t stop until the end. And then celebrate. ← Interviewing Candidates is a Matter of Justice.